Golden 1 Center artists swept the Billboard Music Awards last night. From show-stopping performances, to deserving artists accepting their awards, to honoring an icon; it was an unforgettable evening. Take a look at our top 5 favorite moments from the award show! 1. 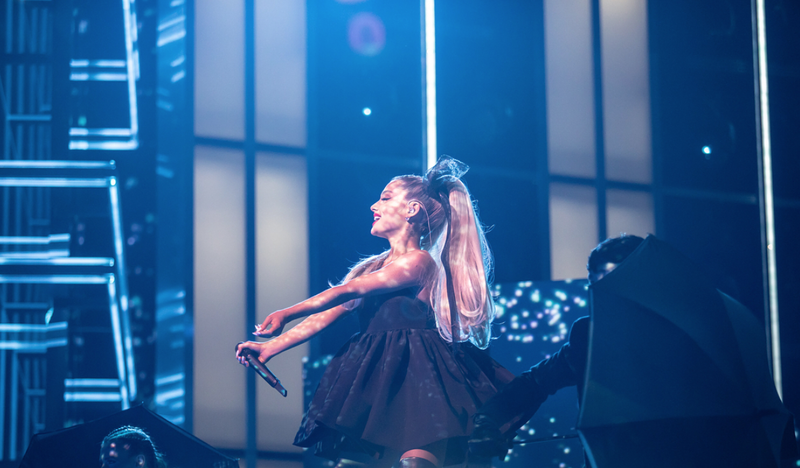 Performing her new single, “No Tears Left To Cry,” Ariana Grande opened the award show with a performance that left us wanting more. 2. Ed Sheeran serenaded us all the way to Dublin last night. Billboard streamed the performance of “Galway Girl” which Ed performed live on tour with a traditional Irish band. After his amazing performance, Sheeran accepted the award for Top Artist, along with 5 other Billboard Awards throughout the evening. 3. Shawn Mendes graced us with his vocals not once, but twice during the show. In his first performance, he sang “In My Blood” to the crowd standing in a field of white roses. His second performance was with Khalid, singing their new song “Youth” joined by the Marjory Stoneman Douglas Choir. The powerful performance was dedicated to victims of gun violence. 4. Bruno Mars appeared to present the Icon Award to Janet Jackson. Thank you, @brunomars, for stopping by to honor @janetjackson at the #BBMAs! 5. Before receiving her Icon Award, Janet Jackson delivered a show-stopping performance showing us all why she deserved the award. It was an amazing celebration of the past year in music. In total, 23 Golden 1 Center artists were nominated for awards, and 6 of those artists took home a total of 25 awards at this year's BMAs. See the full list of 2018 Billboard Music Award winners here.